Grant Cardone Net Worth: Author, real-estate mogul, online entrepreneur, husband of Elena Cardone and father of two daughters are just a few of the titles held by Grant Cardone. From his early days as a used-car salesman, Cardone has amassed a combined social media following that stretches into the millions, built multiple successful online companies, consulted with Fortune 500 companies, and transacted almost $1 billion worth of real estate. But making Grant Cardone net worth estimates isn’t as simple as summing up the value of his real estate because he claims to have over one hundred income sources. And his private companies are not required to disclose financial statements so it’s hard to evaluate their true value. Nevertheless, we can make some calculated guesses about what he is worth from interviews he has given and statements he has made publicly. How Does Grant Cardone Make So Much Money? Perhaps the most pivotal moment in Cardone’s life came at age 10 when his father passed away. As a kid with no father-figure to look up to anymore, Cardone has stated that he missed out on having someone to teach him, guide him, and give him a shot. It’s one of the reasons that he now professes he gives back so much on social media because he remembers the pain and isolation of having nobody to turn to when he needed support. By age 16, Cardone made a bold statement to his mother that he would be rich. But nearly a decade later at 25 he says he was addicted to drugs and eminently unhireable. Despite having a degree in accounting, the only job offered to Cardone was a used cars sales role. He regularly mentions how much he hated selling. But he decided to get good at it, and within 5 years went from selling used cars to selling used car dealers on a sales training program to increase their sales. He grew that sales training program to serve Fortune 500 companies and small businesses. These days, his primary sales training channel is Cardone University. From the cash flow generated selling in the early days, Cardone invested in a single-unit property that went belly up. His next deal was a 38-unit multi-family complex and thereafter, Cardone never looked back in the rearview mirror to consider single-unit residential properties. He has gone on to build a real estate empire that features around 4,000 units and $700 million in property transactions at last count. Plus his investing arm, Cardone Capital claims to have $800 million in assets under management, though much of that is his own. If you are interested in learning more about his life story and how he amassed a fortune from his humble beginnings as a middle-class kid, his books are eye-opening and make for thrilling reading. The 10X Rule is designed for aspiring entrepreneurs who want to build their business dreams and need a step-by-step guide to help them reach their goals. A key to success which Cardone shares is the need to take “massive action” that blasts through fear and loss aversion. Unlike some business owners who search for capital to fuel growth or build products or distract themselves with tasks, Cardone regularly cites the need to pick up a phone or knock on a door and start selling. As a trained accountant he says the top few inches of financial statements track revenues and pay for the subsequent inch of paper tracking costs and expenses. The takeaway is focus on sales and the rest of the business will do just fine. If you are not a salesperson, you would be forgiven for glossing past this book. But Sell or Be Sold is not only for the business person looking to drum up more sales, but also the interviewee who wants to convince an employer to give them the job or the person who wants to convince a partner to date them. Famously, Grant mentions how his current wife, Elena, did not want to date him but he called her for over a year until she finally gave him a chance. He says his mother told him it takes two to tango but he knew better. All it takes, he argues, is one person with complete certainty to win a partner over, or win a sale. In Sell or Be Sold, he shows you how to overcome rejection, shorten sales cycles, and turnaround negative situations. He also teaches readers how to sell in a poor economy, fill a pipeline with new business, and stay positive in spite of rejection. Be Obsessed or Be Average gives permission to hungry entrepreneurs to shun the idea of balance and go full steam ahead in building their business. Unlike many other successful business people who advocate following your passion, Cardone boldly states you should find a way to build wealth, even if it’s not something you like to do. By setting your ego and passion aside, you may be more likely to take the second job you otherwise would have spurned or make the calls you previously considered beneath you. When you are obsessed, you will be more likely to take the massive action needed to succeed. In fact, Cardone contends the most dangerous state of mind is to feel comfortable because it’s easier then to lack the fire in the belly to do what it takes to build enormous success. Rather than benchmark your success against the affirmations of family or friends, compare your success to the potential you believe is inside you. By changing the benchmark against which he compared himself, Cardone says he gained the impetus and drive to reach much higher goals. In Be Obsessed or Be Average, Cardone shows readers how to set crazy goals and disregard naysayers. When you study great businesses, like Facebook and Google, dominant market share is frequently cited as reason why they prosper so much. But how do you grow market share? Cardone shares the sales strategies needed to increase conversions and build margins so new products can be created and a dominant market share can be established. If You’re Not First, You’re Last is also a guide for sales teams to thrive even during economic recessions when customer demand is low or waning. Cardone has multiple sources of income, from books and coaching to real estate investments, that help support his multimillion-dollar empire. Here are some of the primary ways Cardone makes money. Cardone has monetized his Grant Cardone Youtube channel in order to supplement his income. On his channel, he offers how-to and advice videos for entrepreneurs and people seeking to become millionaires as well as a short video explaining who he is and his goal of helping as many people become millionaires as possible. Cardone is well-known in the business world as a real estate investor. He has been involved in real estate since he was 15 years old and currently owns a real estate empire valued in the hundreds of millions. He views real estate as a side business that he can use to hold his earnings from his other ventures rather than depending on it as his primary source of income. Cardone offers a real estate fund in which others can invest. Investors can use personal investment accounts, trusts, LLC or corporation accounts, or in some cases individual retirement accounts to invest in this fund and partner with Cardone on real estate investments. Both accredited investors and those with less money available for investing are welcome to participate. Cardone offers one-on-one coaching with clients who are interested in building their business, making sales, and making money. He also offers group classes through Cardone University that teach students the fundamentals of creating a successful business. Cardone is the author of two bestselling books. 2011’s The 10X Rule explained that while most people take only three types of actions in their business (no action, normal action, or retreat from action), there is a fourth type of action to take that leads to massive business success. His other book, If You’re Not First, You’re Last, focuses on sales strategy and how to beat the competition in your industry for the coveted #1 spot. Both books were New York Times bestsellers and are available on Kindle as well as in print. So what is Grant Cardone’s net worth? His sidekick Captain Ryan, a former pilot, revealed that some salespersons make as much as $400,000 per year with Cardone University because many clients are businesses making purchases of $100,000 or more for sales training packages. We assume the average salary is lower for the sixty or so sales people and estimate the commissions earned are approximately $100,000 per salesperson per year. That would translate to about $6,000,000 in payroll commissions to his sales team. And we would assume that they get paid approximately 20% of each sale, which would put gross revenues for Cardone University at $30,000,000. His sales training program has a high upfront development cost but significantly lower maintenance costs so it’s possible that Cardone is pocketing as much as $5 → 10 million per year from Cardone University. Add another $1,000,000 from book deals and another million from the Grant Cardone YouTube channel and it wouldn’t be surprising if Cardone was making somewhere between $10 million → $15 million annually from those sources. But his income doesn’t stop there. You can hire Cardone for a 1:1 personal coaching session, which will set you back $15,000. He charges $100,000 for keynote speaker presentations. And $10,000 for a virtual sales rally. Cardone is on just about every social media outlet from Twitter to Snapchat. And you can view him on Grant Cardone TV, listen to the Grant Cardone podcast. These income sources are exclusive of his primary wealth vehicle: real estate. At Cardone Capital he claims to manage $800 million of assets, most of which is his own. If we assume conservatively that he personally “only” owns 4,000 units valued at $100,000 per door on average, that’s equal to about $400 million worth of real estate. 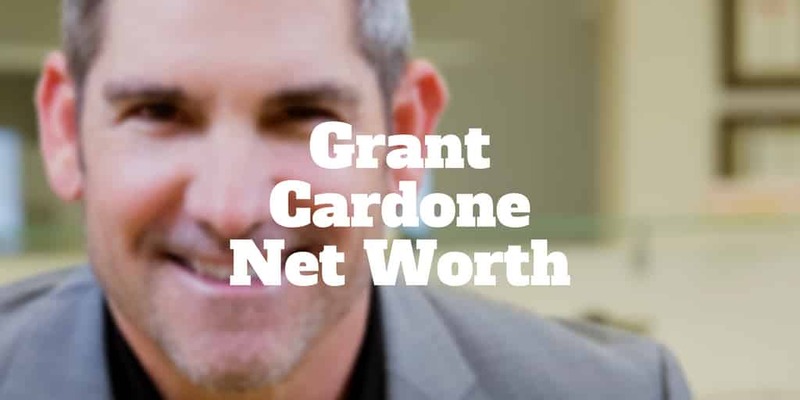 Cardone has been in the game a long time so, on average, perhaps 60% of that is debt, meaning $160 million is his real estate net worth, excluding the fees he charges to accredited investors who participate in his Cardone Capital deals. If as he claims most of the $800 million is his own, then his net worth is closer to $320 million from real estate alone! So how do we arrive at an estimate of Grant Cardone billionaire status? Cardone’s tenants are paying off the debt on his real estate holdings so eventually his share of the $800 million will be worth close to $800 million, excluding inflation. And that would be true if he bought no more property whatsoever. He’s got asset inflation on his side which will increase the nominal wealth of his real estate holdings too. Simply by generating $10 → $15 million in income from sources outside of real estate and adding perhaps another $20 million annually from property investments, Cardone could purchase another $80 → $100 million worth of property each year, without relying on outside investors. He has publicly stated that he regularly ploughs back earnings into real estate in order to rekindle the feeling of being broke and having to generate more. So it’s likely that most of his income is directed back into property investments each year, meaning that the likelihood of Cardone reaching billionaire status is highly probable. Cardone famously once said about dating his wife that “it’s not stalking if she finally says yes” a tongue-and-cheek reference to how he pursued actress Elena Lyons for over a year before she finally relented and went out on a date with him. Since marrying Elena, he has had two daughters, who have featured in his social media feeds. Unlike some parents, Grant and Elena Cardone state that they don’t encourage their daughters not to talk to strangers. On the contrary, he says that it’s important for them to learn how to talk to strangers because in life you can’t do it alone and others are needed to help you reach your goals. When you sum up Cardone’s income from his primary sales training business, income from real estate, book deals, social media channels, keynote speaker fees, and fees charged to accredited investors at Cardone Capital, we estimate his annual income could be as high as $30 million or more. When you add up the value of his businesses and his real estate, we estimate his current net worth is over $300 million and the power of compounding, inflation, debt payoffs, and future deals will catapult him to billionaire status. Follow him on the Grant Cardone Twitter account and updates on his Grant Cardone Instagram account. >> Joe Rogan Net Worth: Does He Make $10M Per Year? ‹ Peerform Review 2019 – Need A Loan But Got Low Credit?